Seeming like a small town of its own, Forest Hill is located on the hill that leads to the 526-acre Prospect Park. Great public and private schools, greenery and beautiful houses attract families with kids to this amazing place. There are so many strollers in the streets that it almost seems you might be in one of Manhattan’s neighborhoods. 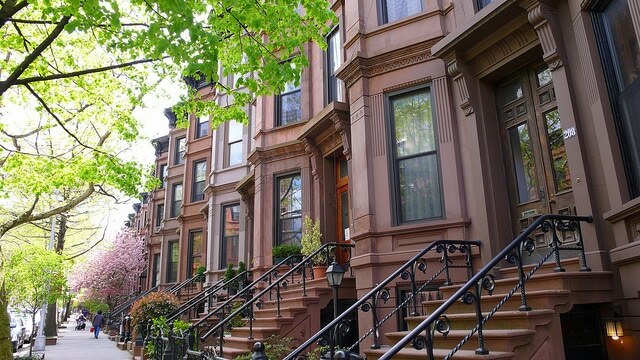 Moving to Park Slope, you will feel its nearly suburban atmosphere. By the way, Park Slope was ranked the #1 neighborhood in New York by New York Magazine in 2010. The Prospect Park Zoo and the breathtaking Long Meadow are some of Prospect Park’s most popular attractions. Brokers say that when people move to Park Slope, they don’t want to leave the place. Every Brooklynite will mention this residential oasis among one of the most popular neighborhoods. Moreover, Park Slope is within walking distance of such Brooklyn landmarks as Brooklyn Academy of Music, Brooklyn Museum, Brooklyn Botanic Garden, and Brooklyn Central Library. Park Slope offers some great places to get an adult beverage: Prospect Bar & Grill, The Gate, High Dive, Freddy’s. The visitors are mostly satisfied with the services at al di là, Beet, Blue Ribbon Brooklyn, Colson Patisserie, Palo Santo, Applewood. Want to get a drink or two after a long day? Beer Table, Fourth Avenue Pub, The Dram Shop, Excelsior, Ginger’s Bar, Pacific Standard, and The Sackett are at your service. Moving to Park Slope, you will also have budget dining options: Almondine Bakery, Bark Hot Dogs, Mr. Falafel, Bergen Bagels, Polpette, Pork Slope, 67 Burger, and many others. If you’re a fan of vintage stores, go to the following vintage stores among the Fifth Avenue: Two Lovers, Life Boutique Thrift, Monk and Vice Versa. The neighborhood also has great bookstores: Community Bookstore, and PowerHouse on 8th. Median rent here is $2,700, while the median sale is $951K. While Park Slope brownstones are really expensive, prewar co-ops and rentals cost more reasonable prices. Moving to Park Slope, you will find one-bedroom apartment rentals rising from $2,300. A Studio can cost you from $2,100 per month, while two-bedroom apartments are usually from $2,900. You can take the F or G train to 7th Avenue. There are many other subway stops around Park Slope on various lines. The northern part is well served by subway lines, including the 2, 3, B and Q. The R train serves stations along Fourth Avenue. Plus, Park Slope residents can pick up the Long Island Railroad at the Atlantic Terminal. The following buses serve the area: B65, B37, B63, B67, B69, B103, B61 and the B41.